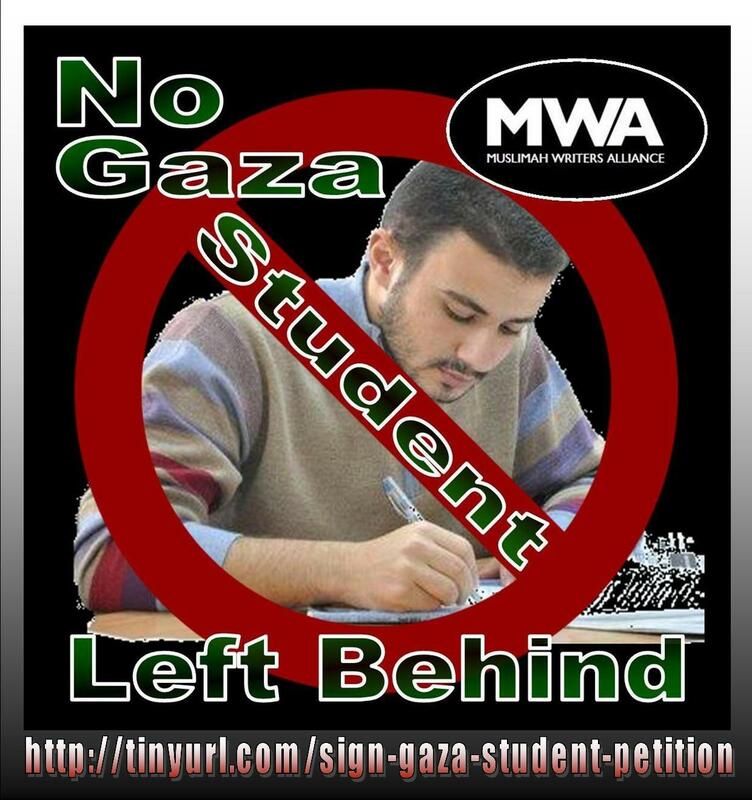 Students of Gaza need your support! 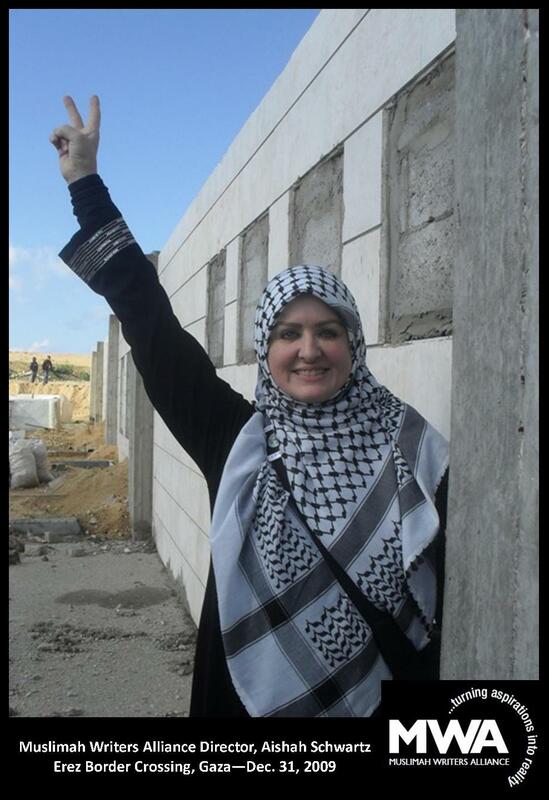 Can they count on you to intervene on their behalf in guaranteeing their right to free passage between Israeli and Egyptian borders to secure exit visas needed to fulfill their aspirations for a brighter future? WASHINGTON, D.C. (MWA-NET) June 15, 2010 - Muslimah Writers Alliance (MWA) urges all citizens of conscience to support the right of students in Gaza to freely pass through Israeli and Egyptian borders for the purpose of securing exit visas allowing them to pursue scholarship and enrollment opportunities afforded to them by universities abroad. "As a returning Gaza Freedom March (Dec. 2009-Jan. 2010) delegate, I can speak first hand as to the intelligence and aspirations of students in Gaza. I met them; spoke with them; and carried back in my heart the memory of their smiling faces and bright, hopeful, soul-searching eyes. Let us join together in ensuring that their hopes and dreams are not in vain," stated MWA Director, Aishah Schwartz. 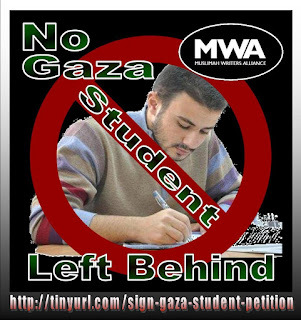 Sign the 'No Gaza Student Left Behind' petition today via either of two links: http://www.petitiononline.com/4gaza/petition.html or http://tinyurl.com/sign-gaza-student-petition, then deliver a copy of the letter provided below to President Barack Obama (details below). AND PASS IT ON! 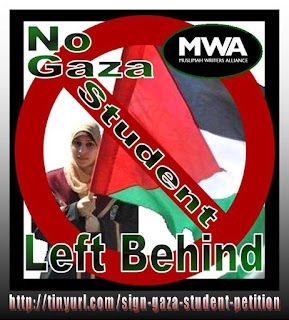 THE INDEPENDENT published a story on June 12, 2010 indicating the following: "Although Egypt opened the crossing in the wake of the lethal Israeli commando raid on a pro-Palestinian flotilla last week, apparently to escape some of the blame for the closure, it has restricted passage mainly to students with visas to study abroad, serious medical cases, and those with foreign residency or passports." NOTE: "students with visas" - THAT IS NOT APPLICABLE TO THOSE STUDENTS WHO HAVE NOT BEEN ABLE TO GET TO EITHER CAIRO OR JERUSALEM TO COMPLETE REQUIRED PAPERWORK OR SECURE VISAS.